I’ve been wanting to share this raspberry sorbet recipe for about two years now, which is a pretty ridiculous amount of time, don’t you think? It’s one of those recipes that gets people asking me, “How much can I pay you to make me a huge tub of this?”. Yes, I’ve had that question multiple times when I’ve brought this refreshing and healthy sorbet to potlucks. But I’ll be quite honest here, this recipe is delicious but it isn’t anything revolutionary. Sometimes I think it’s simple, fresh recipes like this that are a great way to cook and learn your way around the kitchen. Also, sometimes you don’t need to reinvent the wheel, you know? It can be a little difficult sometimes to realize that 99.9% of recipes have already been done, but that’s the just name of the game. I do my best to come up with interesting flavour combinations and dishes that you will love. It’s a fun challenge, and I think that this year, I’ve been doing a pretty good job of it and really focusing on creating new and exciting content (aka delicious and seasonal recipes). Anyways, back to this sorbet, I think the real reason that it is so good is because of the sweet, fresh in-season raspberries. 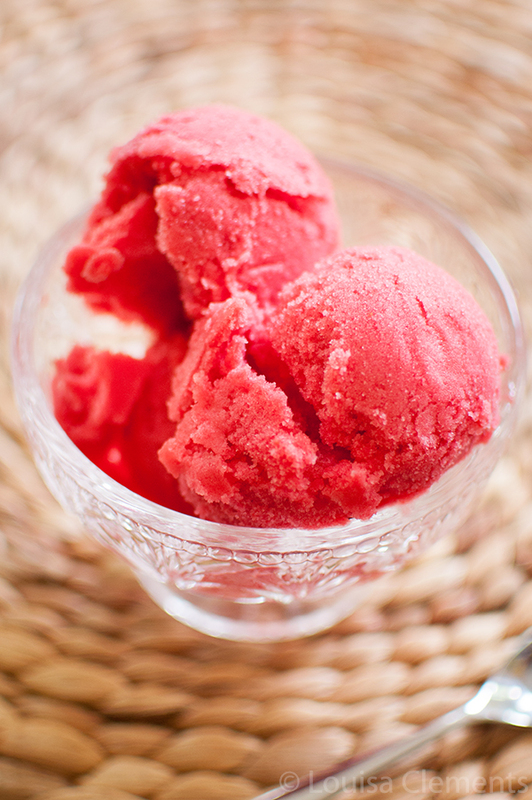 I’m not sure that raspberry sorbet in the winter would be nearly as good as raspberry sorbet in the summer. Actually I know it wouldn’t be nearly as good. There is something really special about in-season produce. Right now, as I’m writing this post, I’m actually in Berlin. This city is magical. The day we arrived was pouring with rain, but that didn’t stop us from wandering down by the water and taking in the beautiful cathedral. Wow, breathtaking. I’m spending the last 5 weeks of the summer travelling with my older sister through Europe and filming pars of my documentary. I spent a day in Frankfurt visiting with friends, I first visited Frankfurt with my Dad when I was 13 and it’s so nice to be back here with my sister (she’s been living and working here for a few months). Now I’m taking in the sights and amazing eats in Berlin. I think I’m in love, Berlin is absolutely breathtaking (did I say that already?). I’m trying to absorb and experience it all. I always love being in Europe and visiting the old, culturally rich cities. It’s almost like everywhere you look there is something more beautiful than the next. Follow me on Instagram for some more sights and scenes from my trip. We’re going to be hitting up quite a few spots over the summer, we’re spending the next couple of days in Berlin then off to Greece to begin filming and to visit my grandparents! It’s going to be an amazing five weeks and I can’t wait for you to join us, virtually, for this adventure. This simple sorbet is made with just four ingredients to let the in-season raspberries shine. With some sugar to balance the tartness and a hint of lime for acidity, this sorbet is the perfect dessert for the dog days of summer. 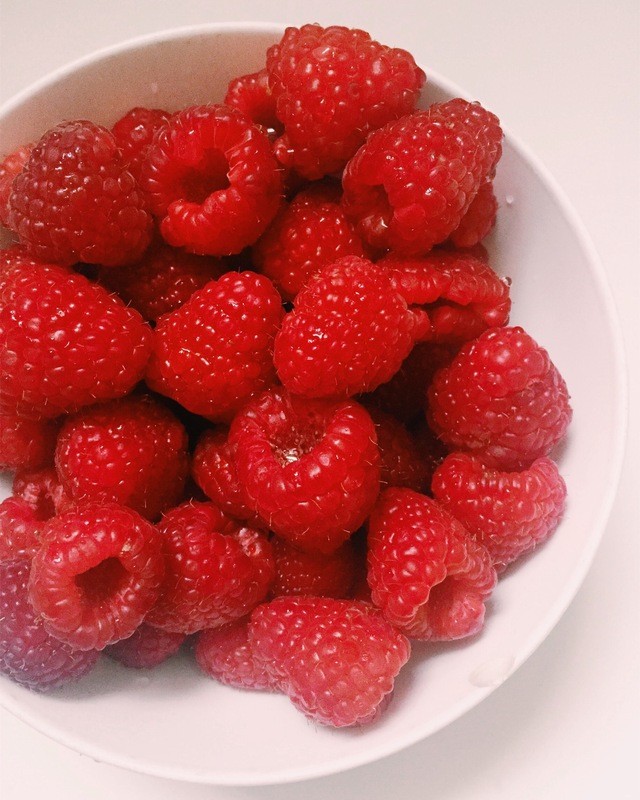 In a blender, blend together raspberries and lime juice. In a fine mesh strainer, strain out the seeds. Meanwhile, in a small pot bring water and sugar to a boil (we're creating a simple syrup here). Boil until sugar is dissolved. Remove from heat and allow to cool. Stir the simple syrup into the raspberry and lime mixture. Cool in the fridge for 2-4 hours. Freeze in an ice cream machine according to machine directions. (I freeze for roughly 15-20 minutes). Wow, this is so refreshing and I love the colour. I wish I could have this little bowl for dessert today! Thank you, Olivia! It is one of the most refreshing desserts, I always have a fresh batch in the freezer during the summer. I agree, simple recipes - done well - are the way to my heart. This looks so inviting for hot summer days, thanks for sharing!